If you have found an infestation of ants it is important to take action right away. Ants reproduce quickly and will likely find your home warm and comfortable. Once they have made themselves at home it makes it very difficult to eliminate them. Summary – This is a tropical American ant that has a painful and venomous sting. Appearance – Fire ants have a dark abdomen with a copper/brown head. They have 3 pairs of legs and usually measure ⅛” to ¼” in length. Nesting – Fire ants are usually discovered in warm places, such as near a fireplace. Another hiding place for these ants is in hollow areas of stone or moist areas in your garden. These ants nest in the ground and can feed on electric wires, clothing, crumbs, other insects and much more. Warning – If you are stung by a fire ant you will likely experience swelling with a burning sensation. It is possible to experience severe reactions to their sting. They are aggressive and often sting multiple times when their nests are disrupted. Summary – This is a South American ant that is known to travel to their destination through coffee ships. Appearance – Argentine ants are a variety of colors which include dark brown, yellow and red. These ants vary in size. Nesting – Argentine ants like to nest in organic, moist environments form ‘supercolonies’. 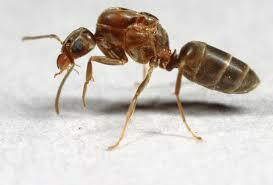 Supercolonies consist of 100’s of queen ants. They will likely invade during a storm or similar weather conditions. This species can eat almost anything, sweet food such as sugar and syrup will attract them the most. Warning – Argentine ants can invade your home or work environment fast. This species can mix with other types of ants and form their colonies together. 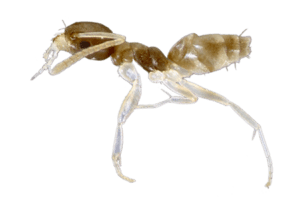 Summary – This is the most common type of ant. Appearance – These ants are black with a basic structure. Black ants vary in size depending on the phenotype. 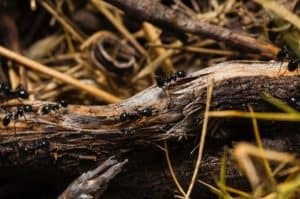 Nesting – Black ants tend to live outdoors but are also found in homes. They are attracted to sweet food such as honey. 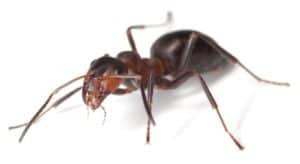 Warning – This species of ant doesn’t cause any harm, but they can build large colonies in your home or workplace. Summary – This is a large ant that is usually found in forested parts of the world. Appearance – Carpenter ants are black or brown with distinctive wings. Their wings are yellow with a cleft between them. These ants have a slim midsection and round thorax. This species of ant tends to be ⅜” to ½” in length. Nesting – Carpenter ants like to burrow into wood to build their colonies. They like to nest in damp and rotten wood but can find a comfortable spot within your home and workplace.. Warning – The ants do not harm humans, but they can cause structural damage when forming their colonies. Summary – Also known as the ‘Saint Valentine’ ant and found worldwide. Appearance – The acrobat ant can be a variety of colors including black, brown and red. 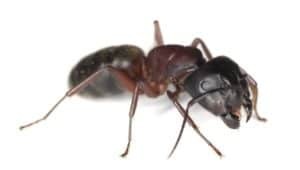 These ants have the ability to change from brown to black very quickly. They are easy to identify due to their heart-shaped abdomen. Nesting – These ants like to build their colonies in moist environments. They will look for areas with rotten wood whether this is inside or outside. Their colony consist of one queen and the rest of the ants are workers. Warning – Also known as the predator species because they like to feed on dead insects, sweets, and proteins. They tend to build their colonies outside but will infest your home or workplace if they find a prime environment. 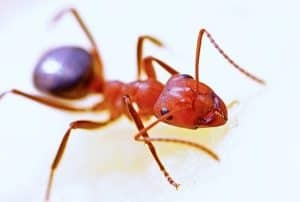 Summary – This is a tropical ant that travels via various goods that are being shipped. Appearance – Ghost ants have dark heads and thoraxes. Their name is due to their pale abdomen and legs, making them difficult to see. These ants are about 1-2mm in size. Nesting – They make very large colonies compared to the various other types of ants. Ghost ants tend to make their colonies in the ground, beside stone or on firewood piles. If you find ghost ants inside they will likely nest in flower pots on inside wall voids. Warning – This species is also known as the predators because they like to feed on the dead insects. Summary – A species of small ants, also known as a sugar ant, stink ant or coconut ant. 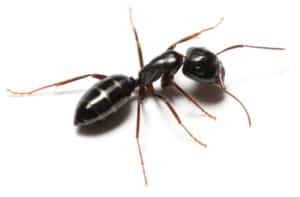 Appearance – Odorous ants will be dark black or brown in color and are very small. They have a single thorax and a distinctive smell. Nesting – They can build their colonies inside electronic items, nests, cabinets, and trees. This is a tough species of ant as they can work in any condition, even if they have damaged limbs. You can avoid them invading your home by keeping your garbage in a separate area and keeping your home dry. Warning – This species reproduces fast as long as they have access to food and water. This makes it easy for colonies to take over your home or workplace. If you crush one of these ants they leave a coconut smell which alerts the other ants in their colonies. If you have experienced problems with any of the ants listed above, it’s important to take action. By acting quickly you can avoid large colonies forming. To completely eliminate these pests from your home you need to find their colony. We provide expert services at any location in Las Vegas. We can exterminate these pests and provide advice on avoiding further infestations. Call us today to find out more!